The APA Planning and Community Health Research Center advances plans and policies for improving the built environment to promote public health. Its website focuses on research, outreach, education, policy and resources to support the integration of community health issues into local and regional planning practices. The American Public Health Association aims to strengthen the profession of public health by sharing the latest research and information, promoting best practices and advocating for public health issues and policies based on research. The Association for Community Health Improvement is a national association for community health, community benefit and healthy community professionals. It is dedicated to delivering education, professional development, peer networking and practical tools to help expand member knowledge and enhance their achievement of community health goals. The Catholic Health Association, a leader in the community benefit field, helps nonprofit health care organizations fulfill their community benefit missions. It provides definitions, examples, guides for planning and reporting, and resources for carrying out community benefit programs. The Affordable Care Act creates an opportunity for health care stakeholders to accelerate community health improvement by conducting triennial community health needs assessments (CHNAs) and adopting related implementation strategies that address priority health needs. The CDC website provides background information, process guidelines, and planning and data resources to help implement a CHNA program. The mission of CoalitionsWork is to promote partnerships for positive change in the health of communities, through collaborative research, education and consultation. Community Catalyst works to ensure hospitals are engaging people in the communities they serve, particularly the most vulnerable and disenfranchised, in their efforts to improve community health. The CHNA toolkit is a free Web-based platform designed to help hospitals and other organizations better understand the needs and assets of their communities. Community Commons also collaborates to make measurable improvements in community health and well-being, by providing data on the subject. This website offers annual County Health Rankings, which are a measure of vital health factors including high school graduation rates, obesity, smoking, unemployment, access to healthy foods, air and water quality, income and teen births in nearly every county in the U.S. The site’s road maps provide guidance and tools to understand the data and strategies that communities can use to move from education to action. America’s Essential Hospitals is gathering resources and promising practices to support essential hospitals and their partners in advancing population health. This site provides a resource for hospitals on the journey to community-integrated health care. Learn more about how hospitals address social and economic factors that influence health. This website, managed by the U.S. Department of Health and Human Services, offers access to health data sets that can be filtered by subject, source, agency, geographic granularity and the year last updated. The site has a “Starter Kit” for entrepreneurs, researchers and policy makers with information on how to make open health data work. The HFMA is a membership organization for health care finance professionals that provides information to help them meet the challenges of the modern health care environment. Healthy City provides information and action resources for service referrals and social change. It offers a list of services by keyword, category or community, a mapping tool for services and demographics, the ability to chart and analyze data by issue, and the opportunity to share and connect with others. The Hilltop Institute’s Hospital Community Benefit Program (HCBP) is a central resource created specifically for state and local policymakers who seek to ensure that tax-exempt hospital community benefit activities are responsive to community health needs. Our Healthcares is a community health connection that facilitates searches for local health partners who provide health education or support and/or health-related events in a specific area. It also links to community health information and local CHNAs that may be available for viewing. The Public Health Institute is dedicated to promoting health, well-being and quality of life. It generates and promotes research, leadership and partnerships to build capacity for strong public health policies, programs, systems and practices. Stakeholder Health is a movement of volunteers working in hospital health systems who see an opportunity to address the underlying causes of poor health in their communities by strategically shifting existing resources and partnering with diverse stakeholders. Trust for America’s Health is a nonprofit, nonpartisan organization dedicated to preventing epidemics. It is committed to saving lives by protecting the health of every community and working to make disease prevention a national priority. 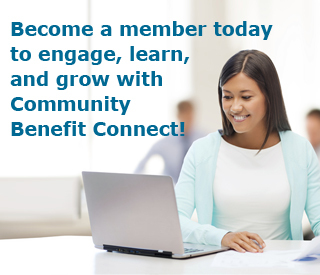 The U.S. National Library of Medicine’s Community Benefit /Community Health Needs Assessment page defines CHNAs and offers numerous links to data, tools, statistics, legislation and regulations, sample CHNA’s, upcoming and archived meetings, resources and organizations. It also provides a list of resources specific to many health-related issues.